It is that time of year when a cup of hot chocolate and a chocolate cookie hit the spot. In my travels I've seen the tree where chocolate comes from and it always fascinates me. 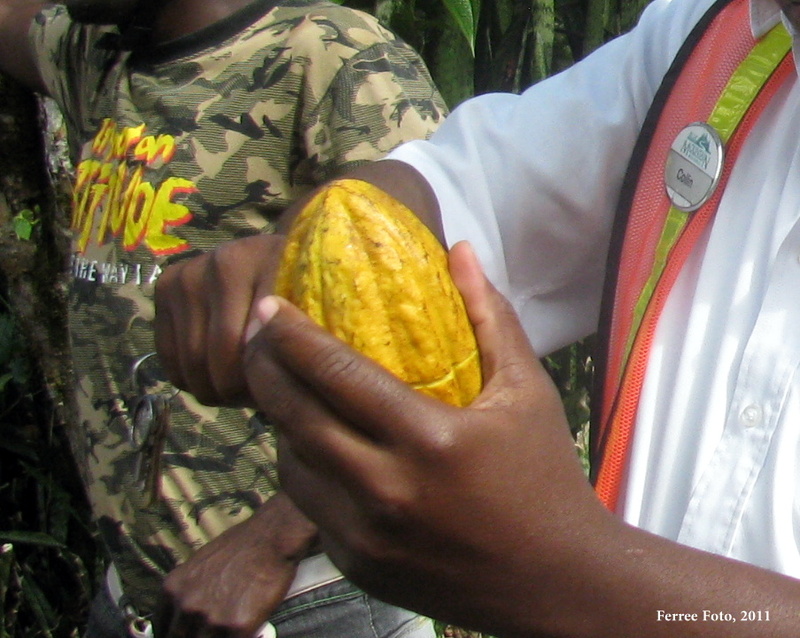 A few years ago a colleague of mine wrote all about chocolate's journey, beginning as a football-sized fruit on a tree in a warm tropical climate. Here is her article. Chocolate grows on the cacao tree (Theobroma cacao). Its name refers to its original status as 'food of the gods' in European and South American tongues. Today we are more likely to say, 'heavenly,' or 'I'm addicted.' Though not actually addictive, chocolate is mildly stimulating, soothing, and has antioxidant qualities. Native to the Amazon river basin of Brazil and the Upper Orinoco River of Venezuela, cacao trees are now grown in about 60 tropical countries. This doesn't include the many greenhouses and conservatories that grow cacao in temperate regions. Cacao trees don't make very good houseplants unless you have lots of room and perhaps an indoor pool to make them feel like they are in a rainforest. Our homes are just too dry for the thin-leaved plants. You may, however, locate one in a warm and humid conservatory or greenhouse. There you'll likely find its pinkish white flowers, which are about the size of a grain of rice, clustered on its trunk nearly any time of year. After harvest, 30 to 50 seeds or "beans" are removed from each fruit. 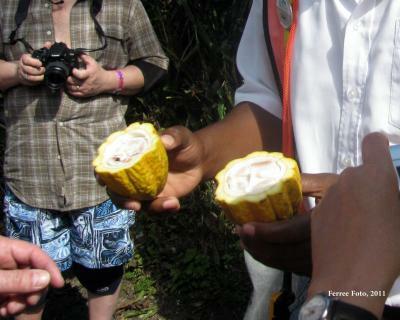 They are fermented for two to eight days to prevent sprouting and begin the development of the chocolate flavor. Then the seeds are dried. The best flavor is developed when sun dried. At this stage, the beans are shipped around the world to process into chocolate. Debris is removed at the factory with the aid of sieves and then the beans are roasted to further bring out their flavor. Next they are cracked open to reveal "nibs." Roasted beans and nibs can be purchased online and in specialty shops. Cacao refers more often to the "beans," cocoa, the anglicized version, more often to the powder of ground-up nibs. In our global economy, cacao is increasingly used for both. Once reserved for the elite of society, the chocolate market is expected to be worth over $98 billion by 2016.